For the ultimate living room accessory, this ottoman is just what you need. 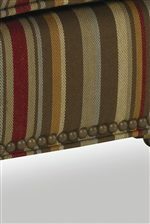 Bringing comfort, function, and style to your home, this item features a plush boxed cushion, a discreet caster on each leg, and traditional-style accents all around. Whether used for extra seating or paired with a chair as a footrest, this ottoman will come in handy no matter what the occasion. 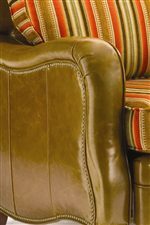 Upholstered in your choice of multiple fabric and leather options, you can create an original look and feel that is all your own with this special-order item. 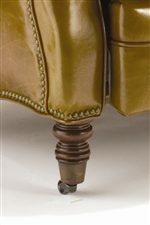 The Tyler Ottoman with Decoratively Turned Wood Legs and Casters by Sam Moore at Reeds Furniture in the Los Angeles, Thousand Oaks, Simi Valley, Agoura Hills, Woodland Hills, California area. Product availability may vary. Contact us for the most current availability on this product. Infused with a rich traditional style from head to toe, the Tyler collection of upholstery furniture will bring a delicate prestige to any room in your home. Featuring a unique recliner and matching ottoman, this collection is built for your comfort and convenience. With each item gently upholstered with plush box-faced cushions in your choice of a wide-variety of fabrics and leathers, this collection offers soft support no matter where you sit. With the addition of an easy-to-use recline mechanism and casters on each item, this duo is discreetly designed for maximum access and mobility. For the ultimate in comfort, function, and style, the Tyler collection is right for you. The Tyler collection is a great option if you are looking for furniture in the Los Angeles, Thousand Oaks, Simi Valley, Agoura Hills, Woodland Hills, California area. Browse other items in the Tyler collection from Reeds Furniture in the Los Angeles, Thousand Oaks, Simi Valley, Agoura Hills, Woodland Hills, California area.